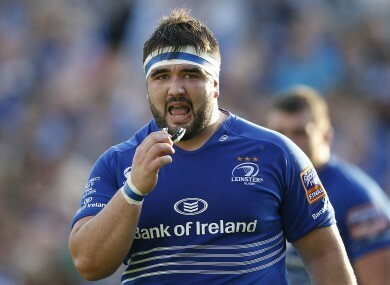 LEINSTER AND IRELAND prop Martin Moore has been ruled out of action for ‘about 12 weeks’ today. The tighthead suffered a shoulder injury and was replaced after 14 minutes of Leinster’s hard-fought 3 – 20 win over Zebre on Saturday. “He got a bang on the shoulder,” said Leinster forwards coach Leo Cullen today. “He actually carried into a scrum-half so I’m not too sure [what happened]; whatever way he twisted his shoulder in the contact. With Mike Ross turning 35 in December, many had expected Ireland coach Joe Schmidt to increase Moore’s playing time in next month’s international series. Now, he will have to look elsewhere. With Cian Healy aslo a long-term absentee for Leinster, the province will turn to Tadhg Furlong and Michael Bent as understudies to Ross for the pool stages of the Champions Cup. Email “Shoulder injury rules Martin Moore out of Ireland's November internationals”. Feedback on “Shoulder injury rules Martin Moore out of Ireland's November internationals”.